A quick reminder that this week sees the release of the collected (trade paperback) volume of the first five Transformers Spotlight issues (Shockwave, Nightbeat, Hot Rod, Sixshot and Ultra Magnus… all written by me, with art from Nick Roche, Mark Bright, Rob Ruffolo and Robby Musso). It should be in shops Thursday (31st of May) in the US and Friday (1st June) here in the UK. For more details and a preview of cover and interior art, visit the IDW site here and check out the New Releases section. Though self-contained, the Spotlight issues feed into (and out of) the ‘ongoing’ Infiltration/Escalation/Devastation series, so don’t miss out. And on the subject of Escalation, the collected edition of that six-issue series came out last week (and so is available right now in all good book and comic shops… or via Amazon if you’re lazy). Thanks to everyone who bid on the first five ebay listings for the exclusive editions of Transformers Movie Prequel #3 (with the variant sketch cover by Andrew Wildman), each signed and numbered in gold pen by myself and Andrew. And congratulations to those who nabbed ’em! The money raised goes to the Draw The World Together charity (which in turn finds its way to the highly worthy EveryChild). For more details, go here. And if you missed out, fret not. The second batch of five are up now — here. What are you waiting for? Get bidding! Finally, my post-script digressions on Transformers Devastation #2 (first promised a few weeks back I know!). My excuse is, having trailered Devastation as a whole, I wanted a bit of breathing space before I launched into issue #2. As always, these will be teasers, not spoilers. Let’s start by talking heads… disembodied ones and Headmasters. There are two main story strands in issue #2 (though inevitably other sub-plots simmer onwards as well). One is Sixshot and his opening salvo, aimed directly at Earth’s Autobot Tactical Response Unit (actually, that happens in issue #1, but the fallout—literally—spreads onwards into issue #2). Not known for his subtlety, Sixshot is pretty much going to blow things wide open (again, literally!) in the saga as a whole. Then there’s Hot Rod and Wheeljack, who are off on their own mission (those of whom have wondered about the fate of Ironhide from Escalation #6, all will be revealed), one with a truly ‘crushing’ deadline, and end up being targeted by the Machination. Yes, it’s the full debut of the IDW-verse Headmasters. As always, expect dramatic differences from the Headmasters of yore. All this Headmaster-y stuff also feeds into further revelations on the fate of both Hunter and Sunstreaker. Now, when I mentioned disembodied heads, you thought I might finally spill the beans on who the Machination’s ‘head’ really is. Wrong. Different disembodied head. Boy, am I a tease! Oh, I’ll be back soon with another script (w)rap on Beast Wars The Ascending #2 (soon!). … with Steve White, editor of the upcoming (first issue is out July 19th) Transformers (UK) comic/magazine. What UK exclusive comic material can we expect in the new Transformers publication? So far we have six self-contained stories written by Simon Furman that although are stand-alones, will tie straight into the IDW prequels. After that, we’re pondering our options; we have contracts for all the various Transformers properties so who knows where we’ll end up? What homegrown talent have you got lined up to work on the project? Aside from Simon (obviously) and Geoff Senior, Andy Wildman and Nick Roche will be doing art for the following two issues. I’d like to see if I can get some of the other ‘classic’ artists interested but I don’t want this to be a complete nostalgiafest. We have to bear in mind we’ll be picking up a whole new generation of fans who only know it from the film, so we can’t afford to alienate them, especially as there’ll probably be a lot more of them! When is the new comic out, and how can fans contribute? What features, other than stories will the comic contain? The first issue launches 19 July – a week before the movie release. As well as the strip, we’re running character profiles and a fun Celebrity Death Match-type feature along the lines of who would in fight between..?, both written by Simon. There’ll be three strips: the IDW prequels, the originated prequel material, and Beast Wars reprints, just for a change of pace. For more information check out the Titan site here. I’ll have my head in the sky on Saturday June 9th, when I’ll be appearing at Orbital Comics in London along with IDW Editor-in-Chief (and co-writer of the Transformers Movie Prequel) Chris Ryall and artist Nick Roche (Spotlight Shockwave, Hot Rod and Kup). We’ll be signing from 12 noon to 1PM (so before the Mark Millar signing down the road at FP), and all comers are welcome to pop along and say hi and get our scrawl all over your nice pristine comics and TPBs. There’s more than a good chance one or all of us will get carried away and impart details of upcoming Transformers goodness, so don’t miss out. Orbital can be found at 148 Charing Cross Road, London WC2H 0LB (just a stone’s throw from Tottenham Court Road tube station/Centrepoint). Their phone number is 020 7240 7672. If you attended the recent Bristol (UK) comics convention, and happened by the Titan Books/Magazines stand, you’ll have already seen this. If not, then feast your eyes on the cover of the first issue of Titan’s UK Transformers comic/magazine (click on the thumbnail, below). The first issue hits (UK) newsagents on 19 July, and is packed with strip (including an all-new 10-page, UK-exclusive strip), features, fact-files and competitions. 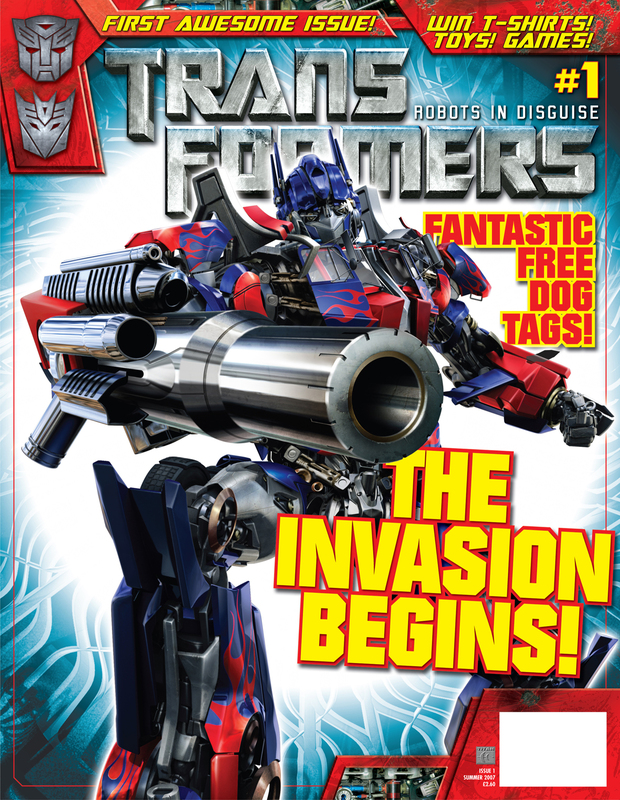 Each issue comes with a highly collectable covermounted free gift, the first of which is Transformers dog tags. 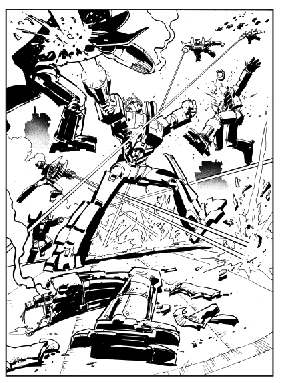 As previously reported, the UK-exclusive strip in #1 is by myself and fan favourite artist Geoff Senior (marking his first Transformers strip work in over seven years). Keep checking back here for information and sneak peaks at what’s coming up, and to subscribe visit the Titan site here. You are currently browsing the simon furman blog archives for May, 2007.